Coming January 12th, 2013… After the Apocalypse! The Mayans were wrong and the world did not end, so we’re celebrating! Century Guild is proud to present a new show on January 12, 2013, which will feature three very different artists exploring visions of life, death, and the possibilities of what may come after. 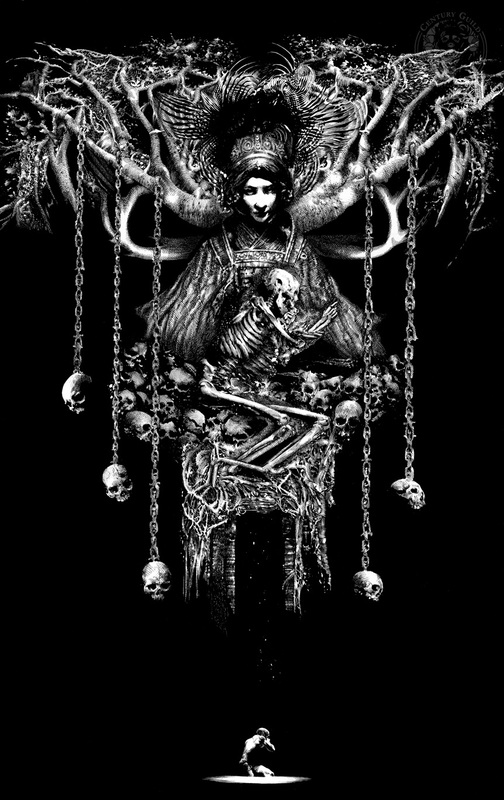 The themes and imagery will be rooted in the human psyche and range from the divine to the obscene, from despair to salvation, from paradise to perdition. We’ll be showcasing very rare artworks by Art Nouveau master Alphonse Mucha, German Expressionist Bruno Goldschmitt, and contemporary artist Richard Friend. In other words, this will be one hell of a show! 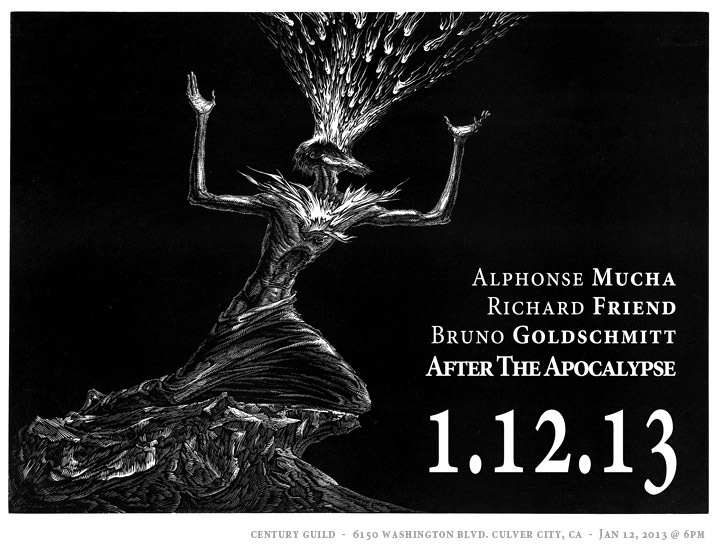 After the Apocalypse… January 12th, 2013 at Century Guild! Featuring the indelible artwork of Mucha, Friend, and Goldschmitt! Alphonse Mucha‘s name should be more than familiar. He was the single most important figure of the Art Nouveau movement and certainly the most recognized for his outpouring of creativity and his prolific capacity. His paintings, illustrations, advertisements, postcards, and decorative designs were hugely influential at the turn of the century and are still highly sought after by collectors today. Aesthetically, the imagery he created with its fine line work, decorative floral elements, and graceful figures of femininity, became the groundwork for Art Nouveau. Best known for his many commercial works, mainly lithograph posters, postcards, and illustrations, Mucha’s work expanded far beyond that as well. Frustrated with the fame he achieved almost solely through his commercial endeavors, Mucha declared that it was his aim to produce artwork that was more personal and spiritual. As a result, Mucha created two series of masterful narrative images, all done in his distinct style, but with greater attention to detail and more thematic intensity. The latter of these two series was his ambitious and enormous Slovanská epopej (Slavic Epic) inspired by the history and legends of the Slavic people. This series consisted of twenty large canvases that took him over eighteen years to produce from 1918 to 1928. 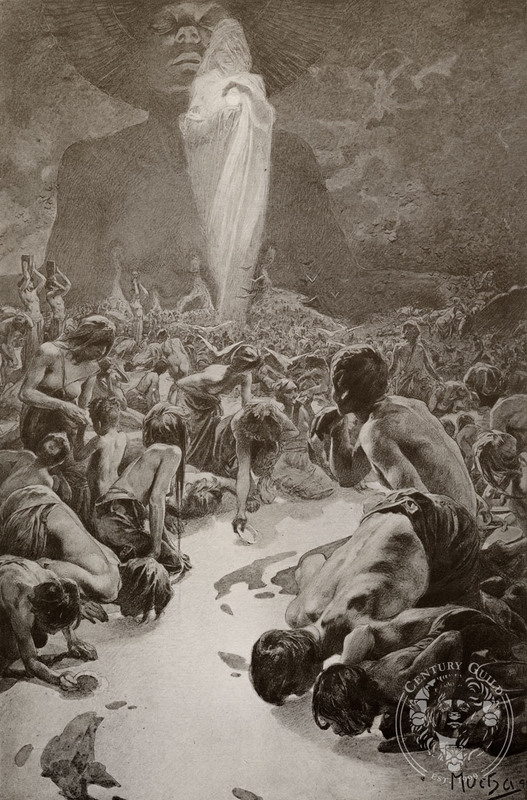 However, of equal import both in terms of his artistic development and the shift in his aesthetic to more complex thematic content, and lesser known due to its limited printing of only 510 copies, are his symbolically rich drawings for Le Pater (The Lord’s Prayer) published on December 20, 1899. 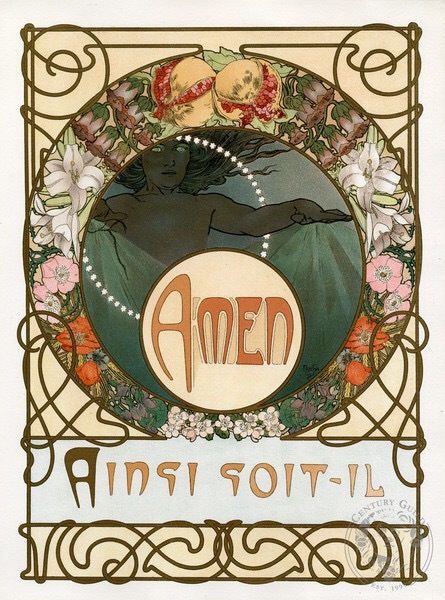 Originally printed by F. Champenois and published by Henry Piazza, Le Pater was an elaborately illustrated and illuminated work in which Mucha took each verse of The Lord’s Prayer and created a corresponding illustration to it. Filled with enigmatic figures and occult motifs, it was described by Mucha in the January 5, 1900 issue of The Sun as “the thing which I have put my soul into”. 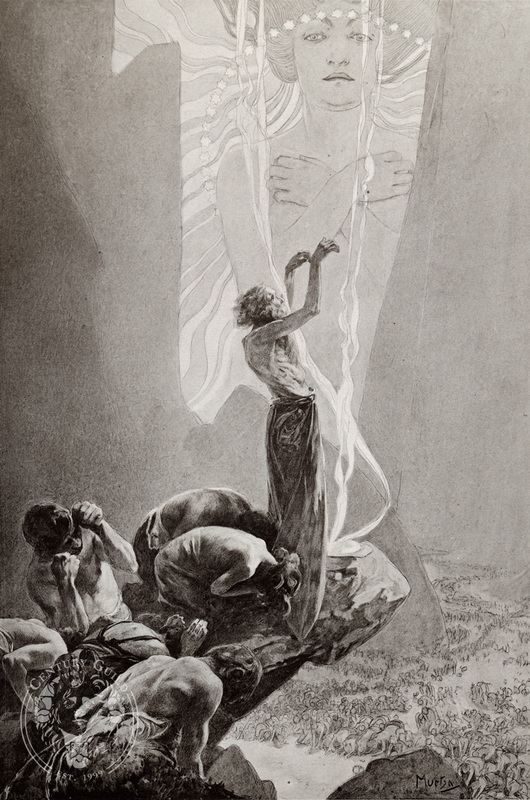 “Hallowed Be Thy Name” by Alphonse Mucha (1899, lithograph). “Give Us This Our Daily Bread” by Alphonse Mucha (1899, lithograph). 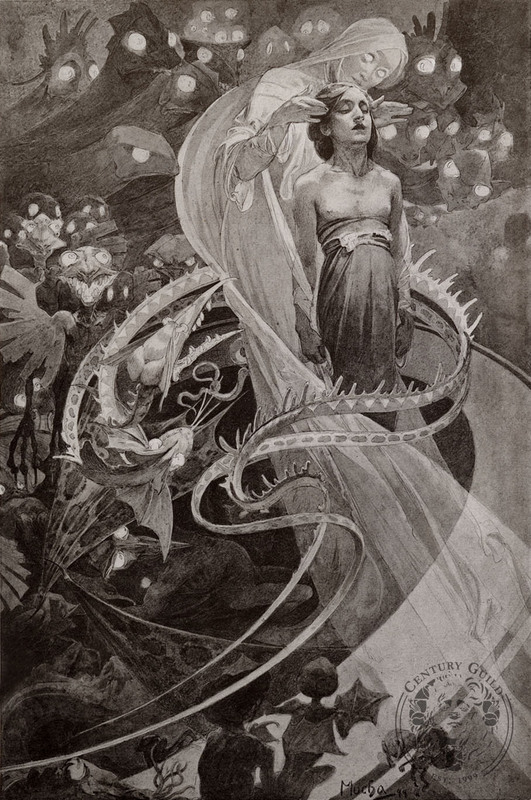 “Lead Us Not Into Temptation But Deliver Us From Evil” by Alphonse Mucha (1899, lithograph). Bruno Goldschmitt was a German Expressionist, who although somewhat obscure today, is probably best known for his printmaking using woodcuts, although he also made tapestries, paintings, and worked in various other mediums. A friend and associate of Nobel winning German-Swiss poet, novelist, and painter Herman Hesse, Goldschmitt was very much of the contemporary school of art stylistically and he incorporated a great number of influences into his aesthetic. His work is imbued with much of the iconography of Symbolism and the emotional potency of Expressionism, as well as the bold line work and sharp, exaggerated angles of the latter. But in terms of the themes he expressed, most can be traced back to Germany’s ancient history and medieval European art in general. Allegorical woodcuts and drawings of classical figures of European myth and legend abound in his work, as do idyllic and somewhat pantheistic scenes of rural countryside activities and seasonal changes, but most fascinating are his dynamic images inspired by the Old Testament. “The Prophet” by Bruno Goldschmitt (circa 1920, woodcut print). “Black Drawing VII: Falling” by Richard Friend (2010, ink on paper). 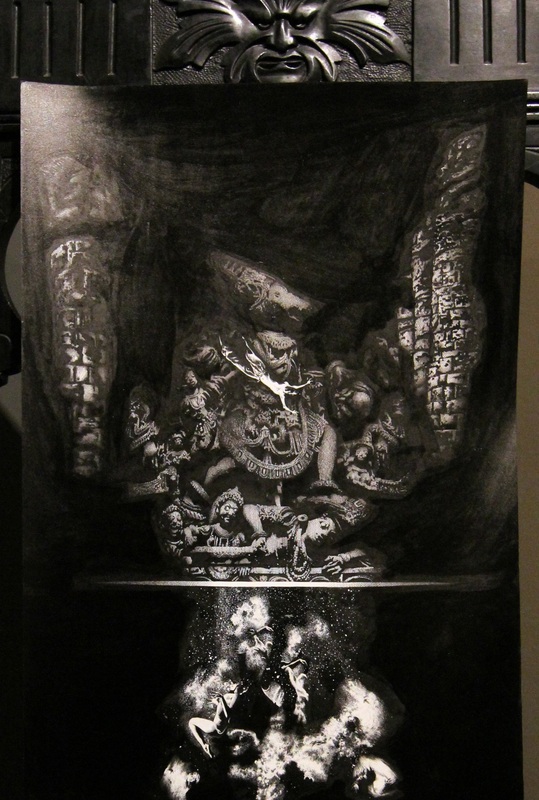 Brimming with imposing shadows, tormented souls, and atmospheric locales, the compositions almost seem caught between recollection and nightmare, and simultaneously function as commentary on societal woes and project the dilemmas of the subconscious, making Richard Friend‘s Black Drawings unforgettable. 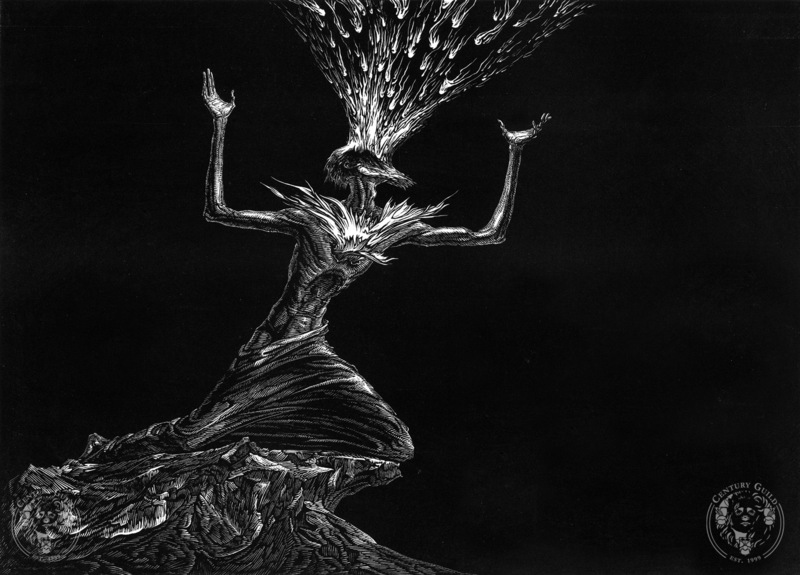 The high contrast of the black and white, the intricacies of the line work, and the pervasive images of decaying buildings, crumbling statues, and of human lives lost in torment help to evoke a haunting mood quite unlike anything else. Spending most of his life as a musician, Richard’s work is understandably endowed with a dark, compelling lyricism that enriches the themes he so adeptly explores. “A Feast of Saints” by Richard Friend (2010, ink on paper). AFTER THE APOCALYPSE opens January 12, 2013 with a reception from 6-9pm at Century Guild. Exhibition continues January 17, 18 & 19 from noon-8pm. For further information or press photos contact the gallery at 1-800-610-CENTURY or gallery@centuryguild.net. So, is the end nigh? Far from it, we’re just getting started.